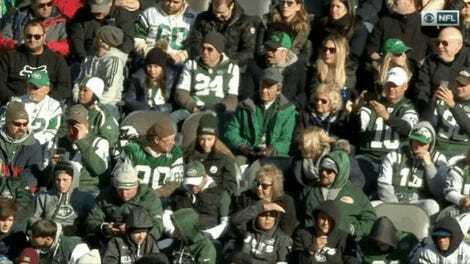 For once, everything seemed to be going against the Jets. They got a pick-six—their first takeaway in six games, a genuinely historic run. They blocked a punt and an extra point. They scored the game’s first 16 points. They were primed to beat the Titans for their first win since Week 6. But then they got it together by failing to reach the end zone on offense and by screwing up just enough on Tennessee’s final drive to blow it at the last minute. Your final: Titans 26, Jets 22. Coupled with the Cardinals’ upset of the Packers in Green Bay, the loss moved the Jets into the No. 3 position for next year’s draft. A perfect outcome all around. But it was dicey for a while there. The Titans had gone zero for their first 10 on third down. Safety Jamal Adams and inside linebacker Darron Lee of the Jets combined for 19 tackles, a sack, and two tackles for a loss. Running back Isaiah Crowell rushed for 98 yards and averaged 4.7 yards per carry. There were bright spots, however. Todd Bowles punted from the Titans’ 40 to open the third quarter, which is what he does. The offense was held to two field goals after halftime. Josh McCown, in his third start in place of rookie Sam Darnold, averaged a paltry 4.3 yards per attempt. But the Jets saved their best stuff for last, after they punted to the Titans with a 22-19 lead, giving them the ball at their own 14 with 1:46 to play. 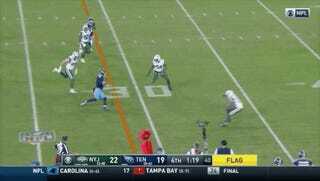 Tennessee had one timeout remaining, but the Jets made sure they never had to use it. 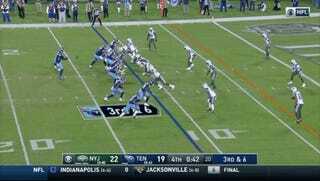 On first down, Titans QB Marcus Mariota scrambled for 11 yards and ran out of bounds, and even though the Titans were called for holding, Jets cornerback Morris Claiborne offset that by getting flagged for defensive holding. Only eight seconds ticked off the clock. 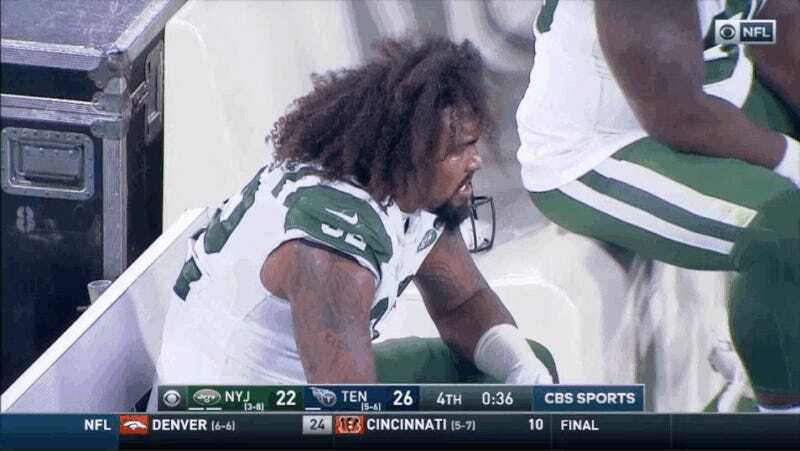 After Mariota threw incomplete on the replayed down, Jets defensive linemen Henry Anderson and Leonard Williams sacked him for a one-yard loss. Ah, but linebacker Jordan Jenkins was whistled for illegal hands to the face away from the play. As a result, the Titans picked up five yards and a first down. Mariota picked up 25 yards. He also managed to recover his own fumble. Oh, and cornerback Trumaine Johnson was flagged for a facemask penalty away from the play, which tacked on another 15 yards. That’s three Jets penalties on the Titans’ first four plays, which was some great hustle. That set the Titans up at the Jets’ 39 with 1:11 to go. After they got the ball back, the Jets put a bow on it all with a McCown interception. That’s the way to do it. Bowles later called the performance “disgusting” and twice said he was “fuming” over what was the Jets’ sixth straight defeat. He also told reporters Darnold “could have played” but didn’t because “needed more reps” in practice after returning from a foot sprain. 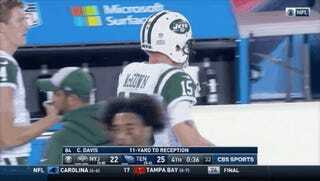 That Darnold already has nine starts to his credit didn’t seem to matter. Even for this team, and even in this season, it was a scintillating way to lose.